Notes: The new DIGI BEATPACK L is a full-featured backpack that has been designed to move your DJ gear comfortably to any gig or event. Despite its ultra-low weight and compact design it offers a huge storage capacity for everything from production gear and a battle mixer, to small controllers or records. A sophisticated assortment of compartments offer thoughtful organization and quick access to your laptop, headphones, cables, and traveling accessories. The DIGI BEATPACK L is the ideal companion for any working DJ on the go. Notes: The new DIGI BEATPACK XL is a full-featured backpack that has been designed to move your DJ gear comfortably to any gig or event. Despite its ultra-low weight and compact design it offers a huge storage capacity for everything from production gear, battle mixers, to larger controllers or records. A sophisticated assortment of compartments offer thoughtful organization and quick access to your laptop, headphones, cables, and traveling accessories. The DIGI BEATPACK XL is the ideal companion for any working DJ on the go. Notes: The DIGI DJ-Backpack was designed to fit all your DJing essentials. Whether you travel with a laptop and control vinyl or a 2-channel DJ controller, the DIGI DJ-BACKPACK can handle it. 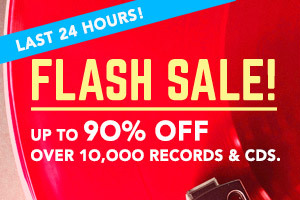 It is also perfect for carrying a portable turntable such as Numark PT01 Scratch or Vestax Handytrax. The DIGI DJ-Backpack is based on the popular RIOT DJ-Backpack and features a camo-green exterior design with red interior. The "Tube-Pocket Accessory-Panel" is perfect for keeping your smaller gear like Bluetooth speakers, GoPro camera, cables, needle-case etc. organized and accessible. Notes: The ultra-slim DIGI STASHPACK sleekly accommodates essential DJ gear and accessories for your day to day travel needs. Equipped with a fully padded laptop sleeve up to 17", the main compartment can hold an additional stash of 12" records, books, or large file folders. The variable zippered top opening gives you an extra 5 cm when unfolded to fit small DJ-controllers such as Kontrol S2, DDJ-SB2, DDJ-WeGo, and similar-sized controllers. Notes: The new Riot DJ-Backpack is the latest and most compact model of the Riot line. It was especially designed for digital-DJs travelling with a basic DVS setup such as 15" laptop, Timecode records and accessories or small controllers. The clever interior layout of the main compartment includes two padded, removable dividers which allowing for three separate protective compartments. Two additional hanging mesh pockets can comfortably fill out the upper area of the backpack and easily hold headphones, cables and smaller gear. The featured "Zip-Around-Expansion-System" doubles the main compartment's capacity, providing useful extra space for even more gear or clothing for overnight trips. 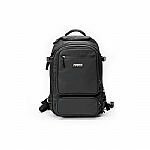 The Riot DJ-Backpack also features a separate side entry compartment that provides quick access to your 15.4" laptop without opening the main compartment. Smaller accessories like soundcards, USB-sticks, power adapters or personal belongings can be stowed in the large front pocket that is equipped with numerous mesh pouches. Notes: The new Riot DJ Backpack XL is a high end, extremely rugged-built backpack designed for the heavy-travelling Pro-DJ. It comfortably holds any digital gear from Traktor Kontrol S4 and similar sized controllers to battle-mixers such as Rane Sixty-Two, Pioneer DJM-T1 or Traktor Kontrol Z2, along with a laptop and accessories. This backpack also fits the new Pioneer CDJ & DJM Nexus 2 models. Constructed entirely from hardwearing PVC Tarpaulin, its outer shell and all zippers are fully waterproof which ensures your gear is protected even in the worst weather. Especially digital-DJs, who need to have their gear well organised and protected for their gigs, will appreciate the clever interior design and the unique features of the Riot DJ Backpack. The main compartment includes several removable dividers, protection panels and foams which can be adjusted to fit different controller or mixer sizes. The featured "Zip-Around-Expansion-System" means the main compartment's capacity can be doubled, turning the Riot DJ Backpack into the ultimate versatile packing monster. This compartment can also be packed and unloaded in two different ways; in the "DJ-booth-friendly" stand-up position and the fully opened and unfolded position to gain easy and complete access. 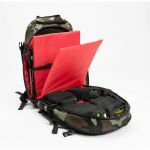 In addition, it is equipped with a separate, padded 17'' laptop-compartment and two large front pockets with numerous mesh pouches that can store plenty of small items and personal belongings. Ergonomic, s-curved backpack straps and the well padded cushioning panel provide ultimate carrying comfort. 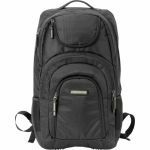 Notes: The new Rolltop Backpack III is an extremely rugged, entirely waterproof and multi-functional backpack that is suitable for a wide variety applications. From carrying your DJ- equipment, to convenient carry-on luggage, or just as a regular daypack, the Rolltop Backpack II does it all well. Its bicycle messenger inspired design features a variable "rolltop" opening that gives you an extra 24 cm when unfolded to fit oversized gear like the Pioneer DDJ-SX, the Numark NS-6, 2-octave keyboard controllers, or even multi-effect pedals. It also features a separate, easy accessible and waterproof-zippered laptop compartment (up to 19'') as well as two additional accessory pockets to stow smaller items as audio interface, headphones, adapters and cables. The ergonomic, S-curved backpack straps, the well-padded cushioning panel, and the hip & chest belts, provide a high level of comfort for your spine and make it comfortable for walking and city biking. For perfect protection of the controller also use the MAGMA CTRL CASE or a Decksaver cover. The new Rolltop Backpack III is an extremely rugged, entirely waterproof and multi-functional backpack that is suitable for a wide variety applications. From carrying your DJ- equipment, to convenient carry-on luggage, or just as a regular daypack, the Rolltop Backpack II does it all well. Its bicycle messenger inspired design features a variable "rolltop" opening that gives you an extra 24 cm when unfolded to fit oversized gear like the Pioneer DDJ-SX, the Numark NS-6, 2-octave keyboard controllers, or even multi-effect pedals. Notes: Turn your SUBPAC S2 into a portable, wearable tactile audio system, while giving you ample carrying capacity for your gear. Stay immersed in your media on the go - from the studio to the street. Constructed of durable double-stitched, water-resistant Cordura nylon with heavy-duty coil zippers, the BackPac has multiple internal compartments and an external zipper pocket to organize a variety of peripherals, a strap to hang your headphones, and sufficient space to carry a 15-in laptop with room to spare. Adjustable shoulder straps allow for a customized fit. Simply insert your SUBPAC S2 into the BackPac's form-fitting sleeve and enjoy club-level bass on the go. With a purpose-built mounting area for your S2's control box, built-in cable management, and ample carrying capacity for your laptop and other gear, you'll be enjoying your S2 in ways you never thought possible. A backpack with bass-heavy benefits. Notes: Multi-functional, retro-styled backpack from Technics which is both extremely practical & also very cool looking. Great as the "go to" DJ bag for your vinyl, laptop, headphones & associated accessories but also highly suitable as an everyday backpack, carry-on luggage and lifestyle bag. Notes: The UDG Ultimate Backpack has been designed for general day to day work use with the digital DJ in mind. 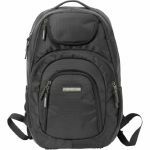 The UDG Backpack is constructed from high quality fabric and contains a padded laptop sleeve that will fit up to a 17" MacBook Pro. The bag main compartment can also hold a small MIDI controller or magazines/paperwork if required. A unique pouch pocket can be found just inside the bag opening that allows for quick access to your headphones. A cleverly designed organiser section and spacer mesh pocket provide storage for small miscellaneous accessories so that your possessions are held safely in place. 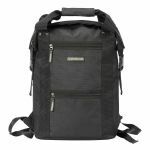 Notes: The UDG Ultimate Backpack Slim is a light weight, slim fit backpack for DJ's that require a smaller version of UDG's larger size backpacks. Constructed from high quality, water resistant nylon, it contains a padded 17" laptop compartment with added neoprene iPad/tablet pocket. The zipper expandable main padded compartment can hold a Numark PT01 Scratch portable turntable or Pioneer DJM-S9 mixer and a few 7" & 12" tone control/scratch vinyl and some clothing. There are enough zipped compartments to securely store microphone, USB sticks, SD cards, wires, cables and faders, AC power adapters and other accessories. This bag comes with a built-in outside USB charger connector, a quick access headphone pocket, ergonomic back padding, comfortable moisture absorbent shoulder straps and a sling so you can slide it on every UDG trolley. Notes: UDG presents the Urbanite Series, cutting edge bags for today's on the go DJ's / Producer's. Each design not only makes you feel good, they make you look great. The Controller Backpack lets you take a wide variety of your essential gear for your digital set up from one gig to the next. It let's you safely store your digital controller in the main compartment while in the side entry laptop compartment you can store up to 19" laptop. It has enough space in the two front pockets to store all your other necessities; hard drives, headphone, cables & accessories and is fully padded in all the right places for the ultimate in protection. The backpack has a 4-method carrying system.